TheRegister has now (August 2013) featured a comprehensive article about the role of Chris Shelton as a UK microcomputer pioneer. 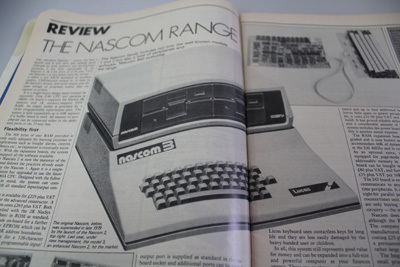 The article features a picture of my Nascom-1. The unit has been carefully preserved in pristine order over three and a half decades. "Myra" was built in 1977. After Nascom was sold to Lucas Logic (1982? ), a plan was hatched to produce a Nascom in a box, more packaged, less of a kit. It was called the Nascom 3. I've never seen one, but would love to find one, especially if still in working order. If it is not working, I may be able to renovate. It is my assumption that the Nascom 3 was a rather crude attempt, by Lucas, to compete with the growing competition. The market for 'home computers' had quickly moved beyond kits. Rumor has it that other than the case, the Nascom 3 was not so much "Intel-Inside" but rather "Nascom 2-Inside". If so, was Lucas the end of innovation for the Nascom and perhaps why it never made it over the chasm? The big money moved in and easily replicated these early machines. I set up this blog to highlight the significance of the Nascom kit computers, designed and produced in the UK and first sold in 1977. 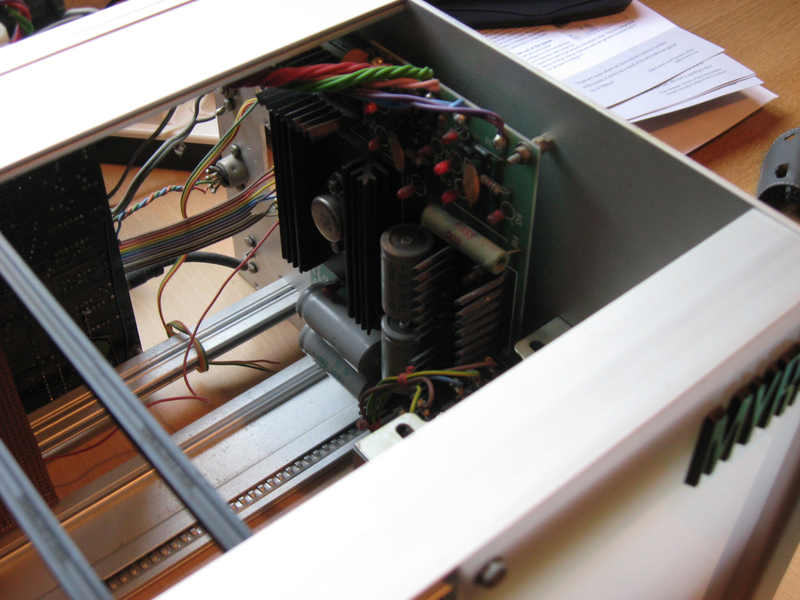 To minimize cost, the buyer had to assemble their computer by hand-soldering over 3,000 joints. The Nascom was popular among enthusiasts because most kits at the time only provided a hex keypad and segment display. Nascom supplied the parts for a full keyboard and video interface. Another factor was the Nascom's bus, which allowed for many expansion options such as a floppy drive and printer interface. 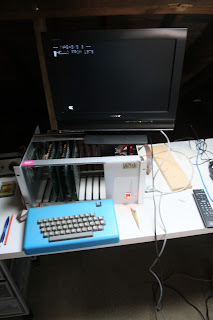 Like me, many hobbyists put their Nascom into a 19-inch rack and added cards as their computer expanded. My own Nascom-1 is still working after three and a half decades. More recently I have acquired a Nascom-2 in need of some serious renovation and another Nascom-2 (pictured below) in perfect working condition and complete with dual 5.5 inch floppy drive. 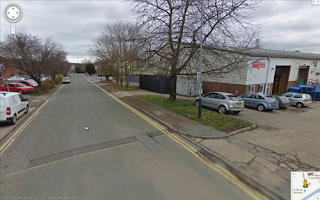 Ken Smith is a retired analog electronics and control systems engineer now living on the South Coast of England. 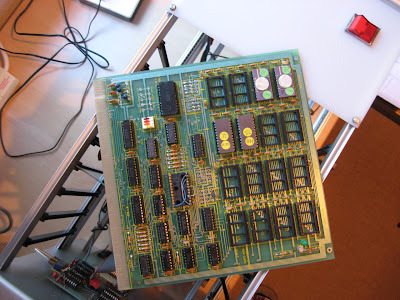 Ken spotted the importance of 'digital' in the early 80s and used his Nascom kit to teach himself about the new microprocessors and programming. He later went on to design custom-designed equipment and control software for various industrial applications. Over all these years, Ken had kept his Nascom in his study and in perfect condition, taking care to keep the components free of moisture, dust and within a purpose built cabinet. Made of steel, the cabinet is immensely heavy and I have found no way so far to move it into my house. The parts of Ken's Nascom have therefore been carefully removed from the cabinet. The journey from Winborne to South London appears to have done them no harm at all. Here is Ken's Nascom in its new temporary home. It is saying "Hello World" using the 1978 version of Microsoft Basic. The monitor is from a Tandy TRS-80. 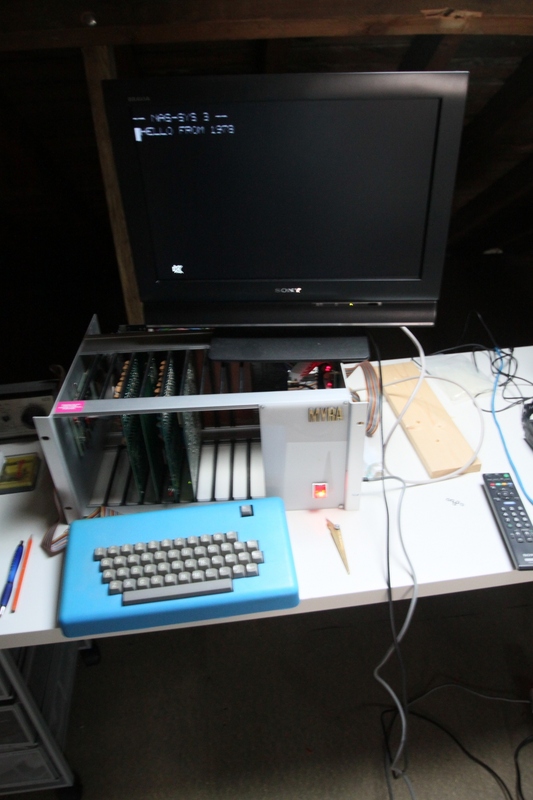 As you can see from these photographs, even the floppy drive is working correctly, listing the directory and reading files. Quite amazing. In the next picture you can see Ken's Nascom loading a copy of an early Word Processor package called SPEX. I know nothing of the history of SPEX (yet) but the manual shown in the photograph states "Copyright Lucas Logic, 1983". I cannot imagine that Lucas Logic (an early specialist in circuit testing) wrote the SPEX software themselves. Who wrote it, what they hoped to achieve and how it ended up at Lucas Logic, I have no idea. The front cover of the manual describes SPEX as "An Advanced Word Processing System". The SPEX floppy disk I have is stamped with serial number SPD000048. Does this mean that at the time Ken Smith bought his copy, Lucas Logic had only sold 48 copies? 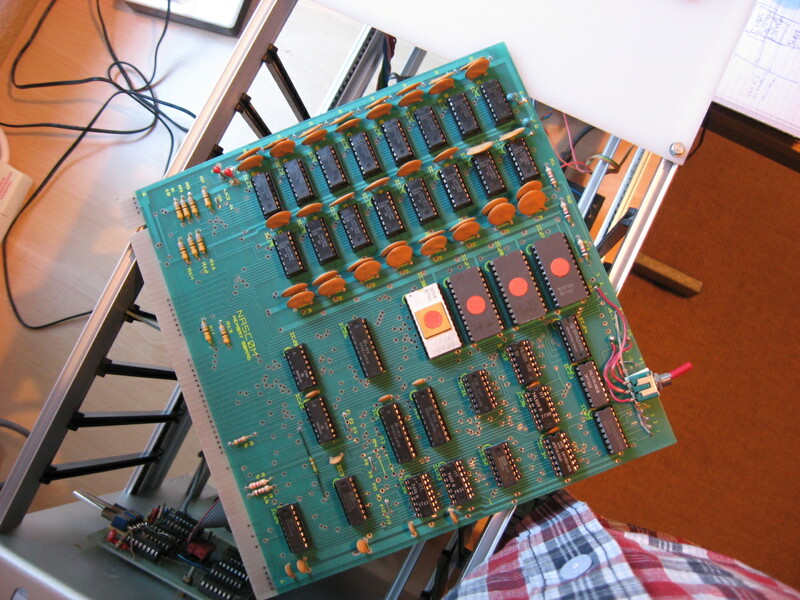 Nascom Microcomputers itself was acquired by, and became a division of, Lucas Logic Limited in 1981. The company was based in Welton Road, Wedgnock Industrial Estate, Warwick. Perhaps SPEX had already been acquired by Nascom. If Lucas Logic were hoped to jump into the PC revolution of the 80s and 90s via its acquisition of Nascom and SPEX, history was not on their side. The same was true of many other pioneering UK companies of the period - misunderstanding the relationship between engineering innovation and business innovation. My intention is to keep these machines safe and in working order until there is interest from a museum such as The National Museum of Computing at Bletchley Park. During a very pleasant day with Ken, he showed me some of the software he had written during his career, including an application for the monitoring of channel dredging operations on-board ships. Despite now being over 80 years of age, Ken is still reading about, and experimenting with electronics and software. His latest ideas are to develop devices to help those who are suffering a disability. 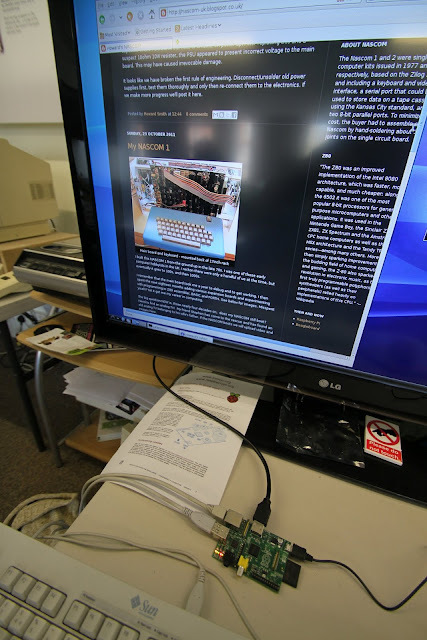 Using Ken's home built PC and the wonder of the WWW, I had the pleasure to introduce him to today's explosion of 'maker' activity and the ubiquitous Arduino and Raspberry-Pi devices. I am hoping that he will take the step to integrate these modern devices into some of the disability projects he has in mind. What a fantastic way to spend one's retirement! When I began the restoration of my 1978 vintage NASCOM, I assumed I would need a source of spare parts, and so began hunting the web for other NASCOM owners or units up for sale. Not surprisingly there was nothing. Then one day a message popped into my inbox. Alec Stansfield in the UK had a unit he wanted rid of. Alec's NASCOM is now safely stowed in my (loft) hackspace. (My thanks to the WWW NASCOM home page for making the connection). Here is a series of photographs showing the inside and outside of Alec's NASCOM as well as the general condition of the electronics. By the time I received the unit I had managed to fix my NASCOM without anything other than a couple of new capacitors on the PSU. So here I am, with a second NASCOM on my hands, wondering what to do next? It seems obvious .... another NASCOM must be restored! A preliminary poke around inside the home made wooden case revealed many corroded components. Yet after opening the case, disconnecting the PSU and doing a bench test, I was amazed to find that despite the severe corrosion around several capacitors, the PSU is working (for short periods of time at least). Levels on all outputs (+12v, +5v, 0v, -5v and -12v) are correct. Spot the four LEDs shining brightly. This all bodes well for further testing. If the unit can boot, my plan is to replicate the design of the original wooden case but in clear Perspex so that it is suitable as a museum exhibit. Alec tells me that the unit has a rich history: As well as building the NASCOM, Alec designed and built a series of enhancements. 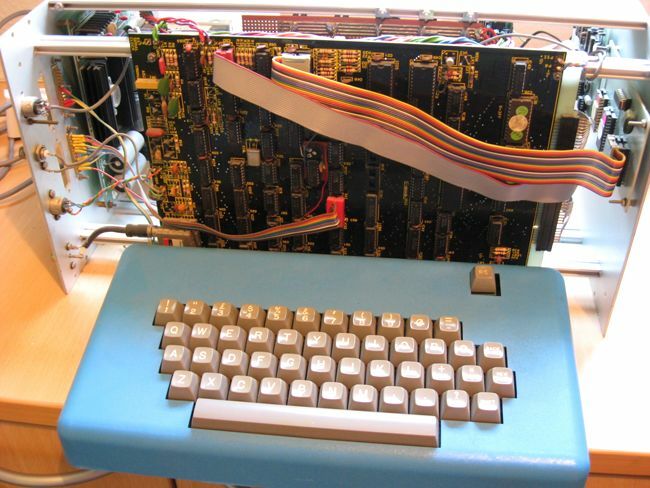 In brief: the additional board under the keyboard is an 8 bit A-D and D-A card. The 1/4 inch jack sockets were input and output for his guitar. The pots (he remembers) allowed control over levels and the amount of signal fed back from the output to the input. The rectangular hole was where a joystick used to sit which also was used to control sound parameters via software. He used the system as an echo machine with his band! He wrote some assembler code (probably now in an EPROM) which sampled the guitar input, used the RAM like a tape loop, and output the sound a controlled delay later. He thinks he used to change the NASCOM boot address via some DIP switches to run my echo machine code - but it's too long ago for him to remember all the details. 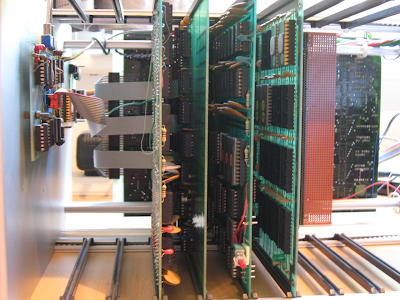 The EPROM piggy back board allowed him to have two firmware EPROMS in the system and switch between the two. The other expansion board (mounted atop the main board) is a monochrome hi-res graphics card which he says he "knocked up". It worked - but he can't remember much about it. He says that I should find circuits for both boards among the folders of notes that came with the unit. 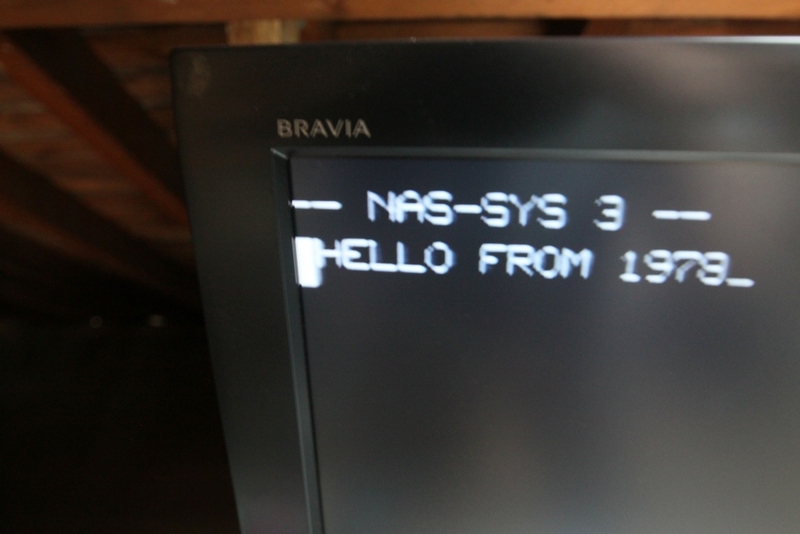 Following repair to the PSU, my NASCOM 1 has successfully booted into NAS-SYS 3. 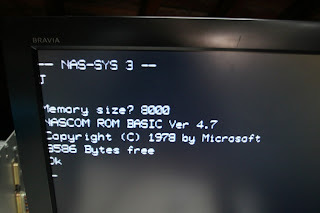 Even more excitement, using the J command it jumped to a ROM resident version of NASCOM BASIC Ver 4.7, Copyright (C) 1978 by Microsoft. A little bit of history has been unearthed. Bill Gates understood that the future lay in software. Following the unfortunate problems we had with the PSU, it has now been repaired. A bench check, isolated from the mother board, is now showing the correct voltages on all pins. The PSU has now been re-connected via a terminal block. Upon powering on, there is some kind of video signal, but the old analog TV we have has lost its remote, so there is no way to 'tune' to the NASCOM. There is certainly a signal there, but whether it is just carrier is impossible to tell. The hunt is now on for an analog TV with manual tuning. So, we still don't know whether we damaged the main board during the first power up in which the PSU malfunctioned, but will find out soon enough. In March 2012 we attempted to re-boot my circa 1978 NASCOM 1. (Video to follow). The attempt was not successful and we may have damaged the main board. A 2.2uF capacitor in the PSU burnt out (lots of smoke) on power up. After replacing this and a suspect 10ohm 10W resister, the PSU appeared to present incorrect voltage to the main board. This may have caused irrevocable damage. It looks like we have broken the first rule of engineering. Disconnect/unsolder old power supplies first, test them thoroughly and only then re-connect them to the electronics. If we make more progress we'll post it here. I built this NASCOM-1 from the ground up in the late 70s. 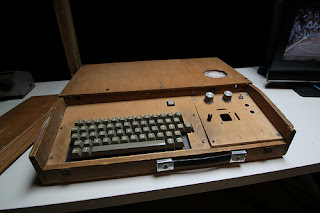 I was an early computer 'hobbyist' in the UK. There were only a handful of us at the time, but eventually it grew to 100s, and then 1000s. 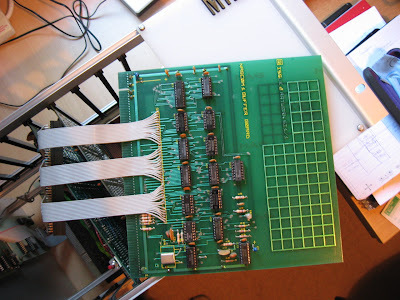 The main board took me over a year to debug until it worked properly. 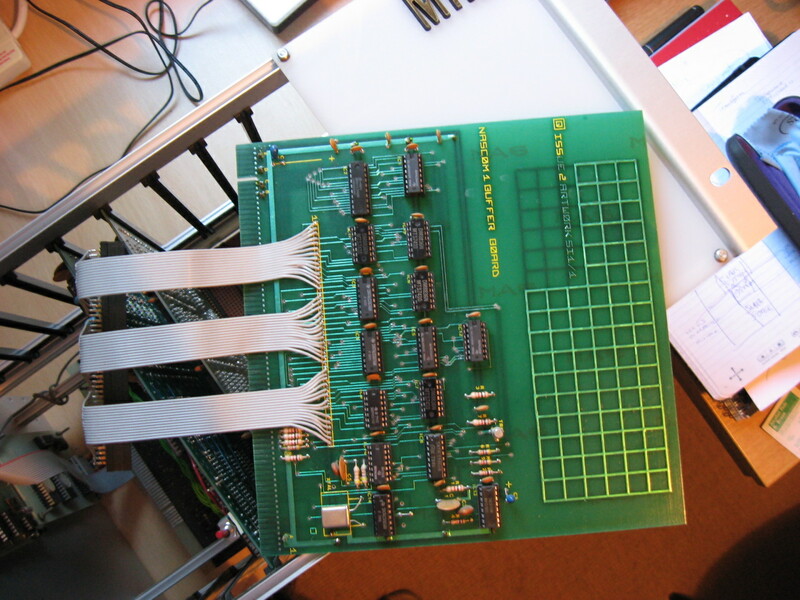 I then spent the next eighteen months adding various expansion boards and experimenting with programming in Z80 assembler, BASIC and FORTH. I ported a Forth interpreter to this machine and still have the four (4) cassette tapes. (they are about to be 'digitally' archived) The original Forth kernel I 'found'. It was written in another assembly language (6502 but cannot be sure). I converted this Z80 code by hand (a few hundred lines), and then blew it onto an EPROM. That got me a Forth boot prompt. The rest of the Forth environment (hundreds more lines) I manually transcribed to the NASCOM, and then saved to cassette tape as an 'image' of the memory: a complete environment. This I could load 'at will', a process that took about 2 hours. After that, I could 'code' in Forth. Misspent youth? Yet it got me a career in computing. Forth was (and still is) an interesting stack-based interpretative language. It is often used for 'embedded' applications, where I specialised in during the first years of my career. I may still have the original Forth kernel listings (on the wide listing paper of the era) in the loft. Must go find them. I have an old cassette tape recorder to play the aging images into the NASCOM via the home made TTY interface. Will the quality of the audio on tape have degraded? Fun for another weekend. 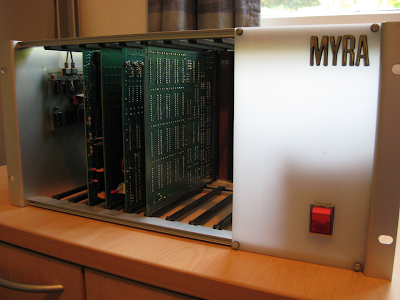 View from the front - showing name "Myra"
The NASCOM I built has several add-on expansion cards in a rack, including a 64K RAM card. In the pictures below you can see front, back plane, keyboard, add on cards (ROM, RAM, interfaces), PSU, tape/serial interface and yes, its name, Myra. No idea where that came from. A school boy fantasy? While I was proud of my Forth port, an obsessive labour of love, I never went as far as some of the other guys on the hardware side. Specifically, I would have liked to have built a floppy interface and moved away from tape. For some reason this never happened. Perhaps time run out, and I was off to university (physics). I shall never understand why I did not read computer science at university. Perhaps it just seemed to be a 'hobby' Perhaps being good at a subject at school, in my case physics, led me in the wrong direction. I was heavily influenced by one inspirational physics teacher. But computing was where my head was. I ran the school 'computer club' from the age of 14, and we completed many interesting projects together as a team. After physics at university, I switched track just as fast as I could to ride the IT wave I saw coming. I owe everything I have - family, home, career, skills - to the rise of computing from the mid 80s to today. And I have been blessed to work in some truly interesting and challenging 'one of a kind' projects. Some details of the add-on boards in my NASCOM rack. I mounted the main board in a 19inch rack. A bus was constructed using veroboard. Onto this was mounted multi-pin connectors. There was space for five expansion boards. The boards slotted in from the front. 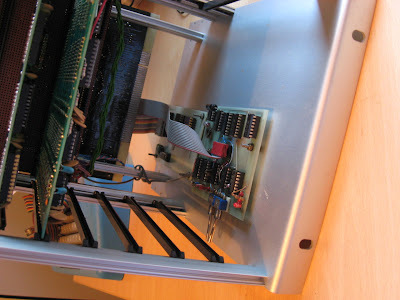 The PSU was wired to the bus and from there to the NASCOM main board. A "buffer" board connected the expansion bus to the NASCOM main bus connector. In the pictures below you will see the back of the one of the memory boards. This one never worked, due to timing problems. The community suggested various "hacks" involving capacitors, but the board never worked. It sits in the rack unconnected as a 'space' for memory chips. A replacement board had to be bought and built. I used ZEAP to port FORTH to the NASCOM. The debugger was essential. My mind is playing tricks, for I remember having EPROMs for BASIC, and FORTH. The BASIC I bought on tape and transferred to EPROM (I think). 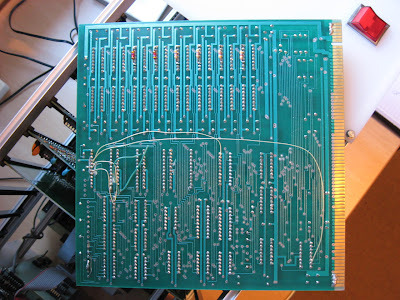 The FORTH I ported from another assembly language and had on tape, and I think, EPROM.